Linuxslaves.com - For those who use Telegram desktop and want the app indicator to match Ubuntu's top panel, here's how to do that. Telegram is a reliable cloud-based mobile and desktop messaging app with a focus on security and speed. It works much faster and simpler than WhatsApp. The best thing about Telegram is we can use it on all your devices at the same time. It will automatically syncs messages from your phone with your computer using Telegram’s encrypted cloud. A GitLab user Bandot has created a set of replacement Telegram tray icons which you can use to replace the original Telegram icon. As I have mentioned earlier, the icons cover 1000 unread message only. If the message out of custom icon number, it will be automatically generated with default Telegram style. Linuxslaves.com - NVIDIA has released a new stable Linux graphics driver. This is the first stable release in the NVIDIA 418 series with new GPUs support including GTX 1660 Ti, RTX 2070 with Max-Q Design, and RTX 2080 with Max-Q Design. Linuxslaves.com - CopyQ clipboard manager 3.7.0 was released 3 days ago with bunch of fixes. The latest version can be installed via PPA repository in Ubuntu 18.10, 18.04, 16.04, and 14.04. Linuxslaves.com - PPSSPP 1.7 released on October 27, 2018 with large number of compatibility, bug fixes, and improvement. If you've previously had problems with crashes or instability, I recommend you to upgrade the app. 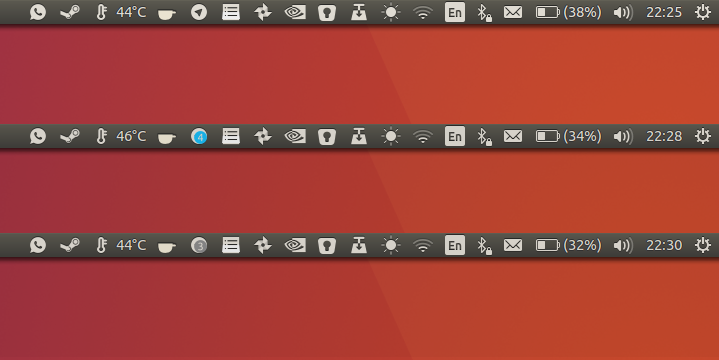 Linuxslaves.com - Today I'm gonna show you a very quick tip to add "Show Desktop" icon in Ubuntu 18.04 and 18.10 dock. 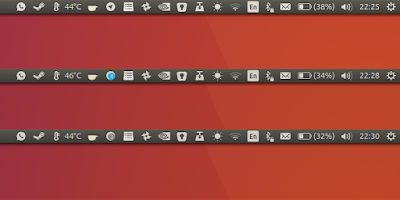 This feature has dropped since Ubuntu switched from Unity to Gnome as its default desktop environment. Linuxslaves.com - As most of you may already know, Elementary OS 5 Juno is available to download few days ago. Sadly, it lack Ayatana AppIndicators support. So today, I'm gonna show you how to get the tray back. Linuxslaves.com - Shutter is feature-rich screenshot application for Linux. You can take a screenshot of a specific area, window, your whole screen or even of a website, apply different effects to it, and draw on it to highlight points. Linuxslaves.com - Looking for net speed indicator to shows the current download and upload bandwidth of a network device in the top panel for Elementary OS 5 Juno?. Well, you should give Wingpanel System Monitor Indicator a try.